Please join us for chili, garlic bread and desserts! 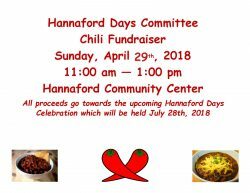 Proceeds go towards Hannaford Days 2018! If you can’t make it, we will line up a delivery!